Summer in Hokkaido has a lot to offer. The prefecture’s gentle summer climate is perfect for flowers; tourists flock to the colorful displays. 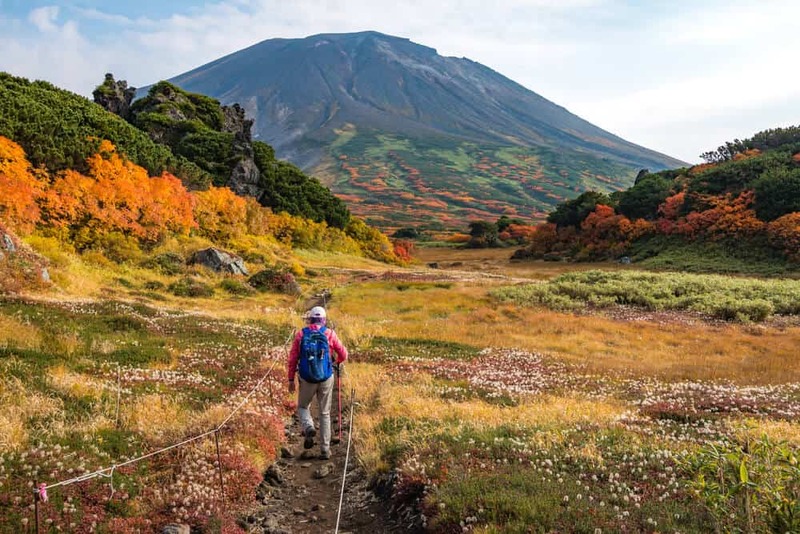 Outdoor enthusiasts can’t get enough of Hokkaido’s national parks. They love the active volcanoes and gorgeous lakes. This article focuses on summer attractions you can easily reach from Asahikawa. 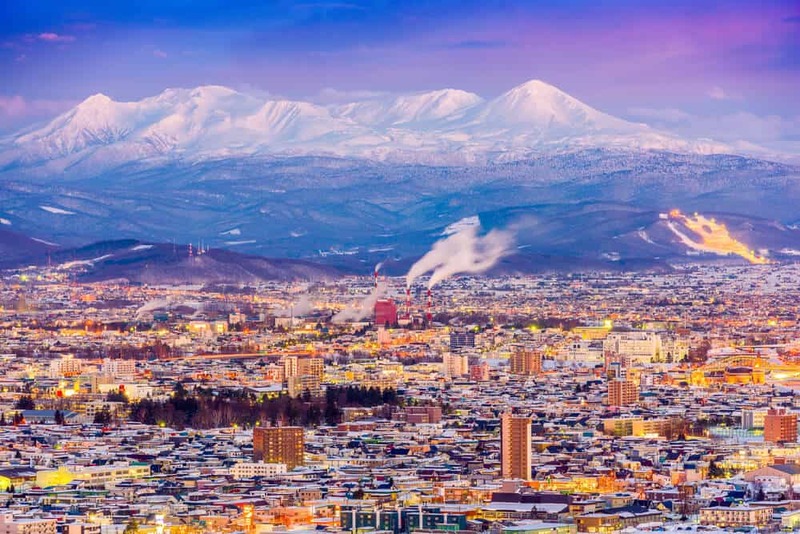 We suggest using Asahikawa as your base in Hokkaido to save time and keep transportation costs down. 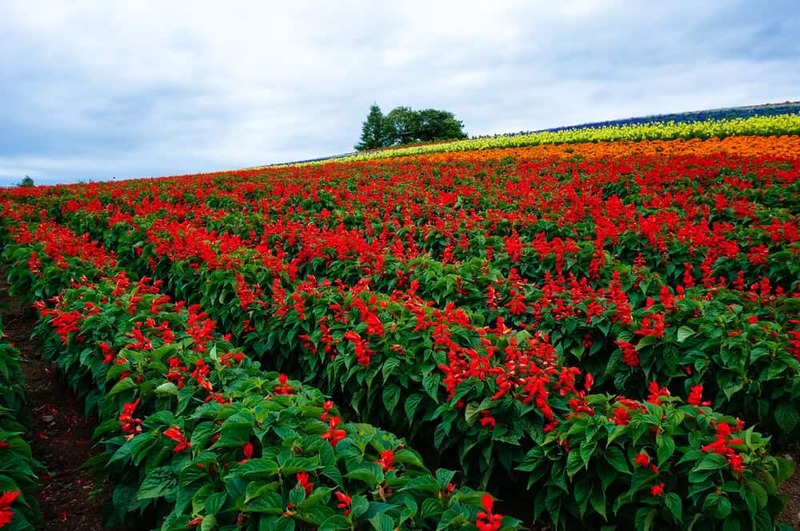 Asahikawa is a great base for day trips to the flower fields of Furano and Biei. In these delightful towns, flower fields create unforgettable scenes of beauty. It’s also easy traveling distance from Daisetsuzan National Park. 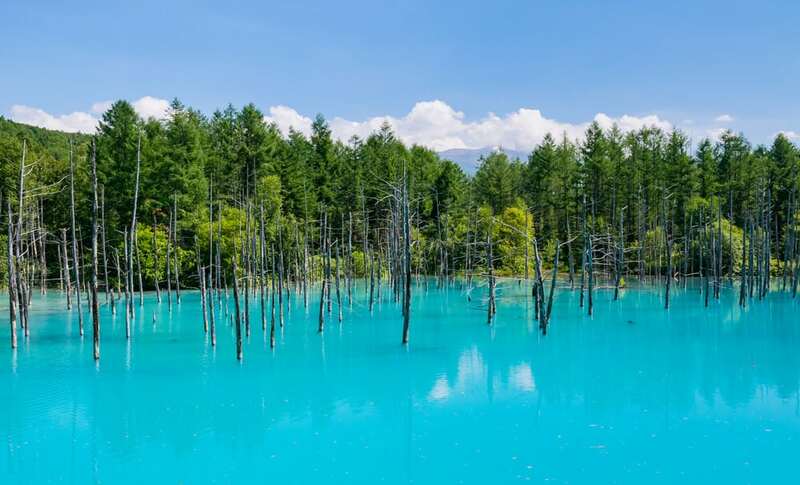 The park is Japan’s largest national park and features the famous Asahidake Onsen. 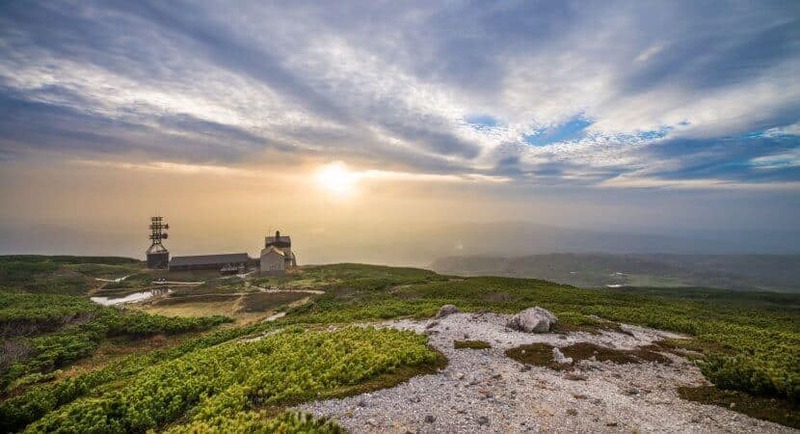 There are all sorts of fun activities near Asahikawa, from hiking to cycling to relaxing in one of Hokkaido’s many onsen. Make Asahikawa your base and explore the best of the Hokkaido summer. The small towns of Biei and Furano boast the most colorful summer scenery in Japan. The towns sit in Hokkaido’s center. 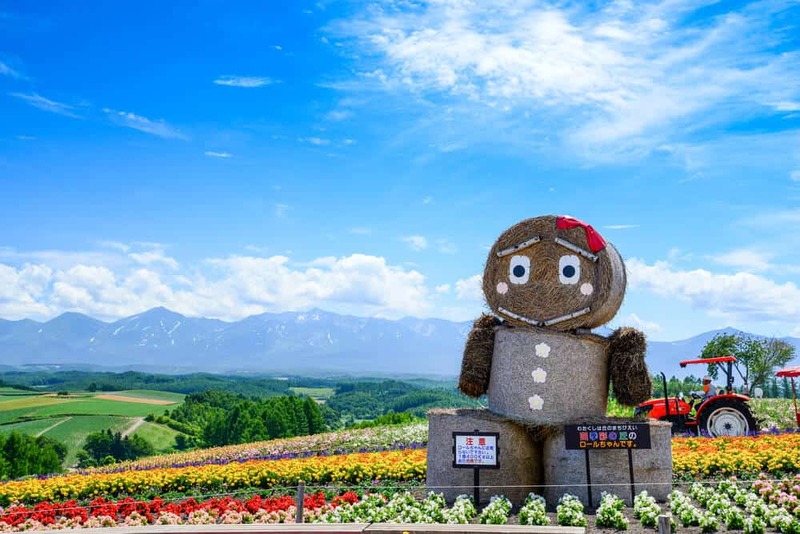 Furano is known as “The Bellybutton of Hokkaido” for this reason. The summer flowers attract ten times as many visitors as the winter ski fields. You’ll understand why when you see the place… the bright flowers resemble a colorful quilt thrown over the hills surrounding the towns. Lavender is the main attraction. It blooms in early July and the season continues into mid to late August. There are four distinct types of lavender cultivated in Furano. They range from violet to dramatic royal purple. There are also poppies, salvia, scarlet sage, marigold, lilies, and sunflowers. 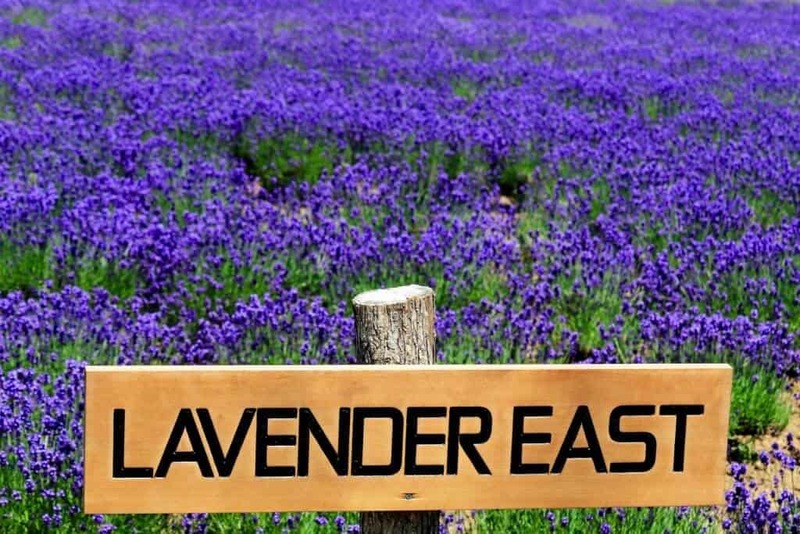 Let’s visit a few of the farms where you can see lavender and the other flowers in full bloom. 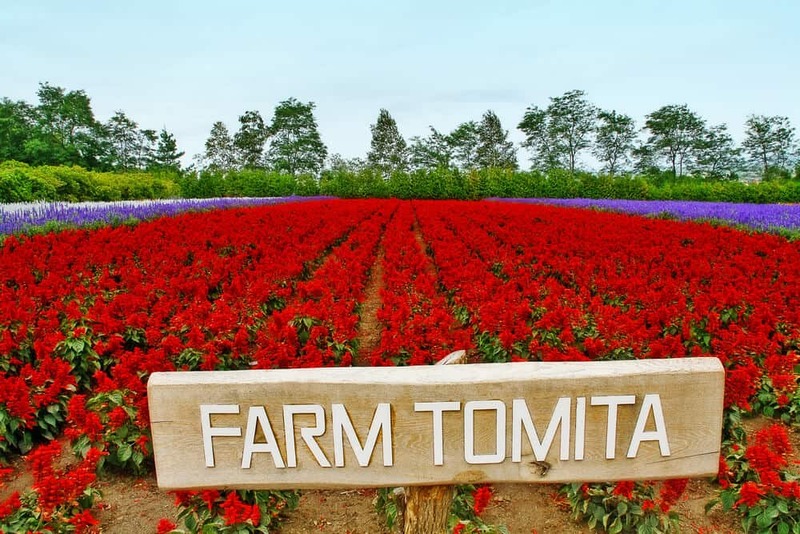 Farm Tomita (Located in Naka-Furano) started growing lavender in 1958. 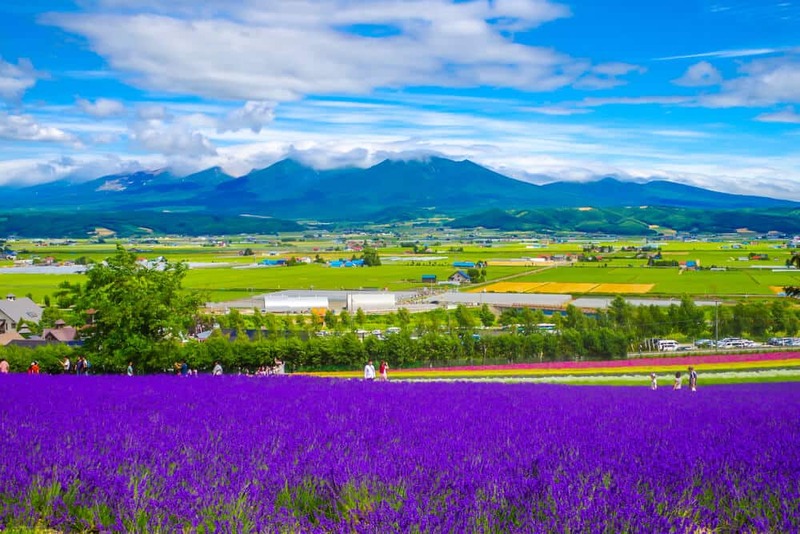 Today, it’s widely considered the best place to see lavender in Hokkaido. The farm has more than a dozen flower fields. My favorite was Irodori Field, planted in a rainbow design. The traditional lavender garden is beautiful as well. Also, check out the greenhouse where you can see lavender all year long. Tomita has a museum, a gift shop, and restaurants. 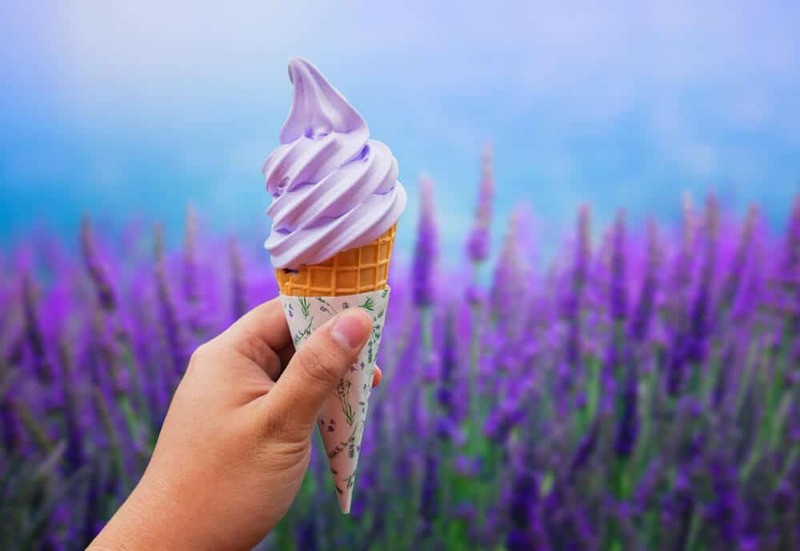 The cafes serve the farm’s produce — including lavender flavored soft-serve ice-cream. The farm itself and parking lot is technically open 24hours, but certain fields and shops have their own hours of operation. Keep in mind that most of the cafes and houses only open for a short time each year, with most being closed from around October/November through April/May. 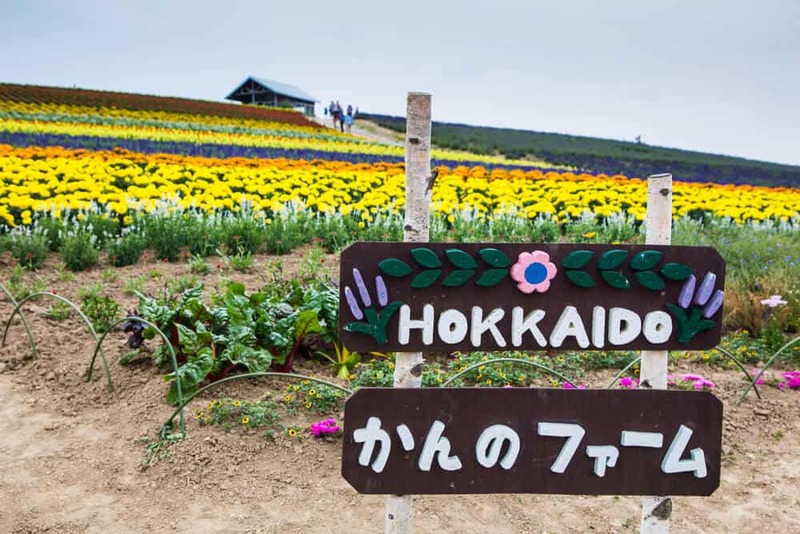 Kanno Farm (Located in Kami -Furano) is known for its variety of colorful flowers. They include lavender, salvia, poppies, marigolds, and blue and red varieties of sage. It takes a little over a half an hour to view the farm. You’ll love the view from the hill at the top of the farm. 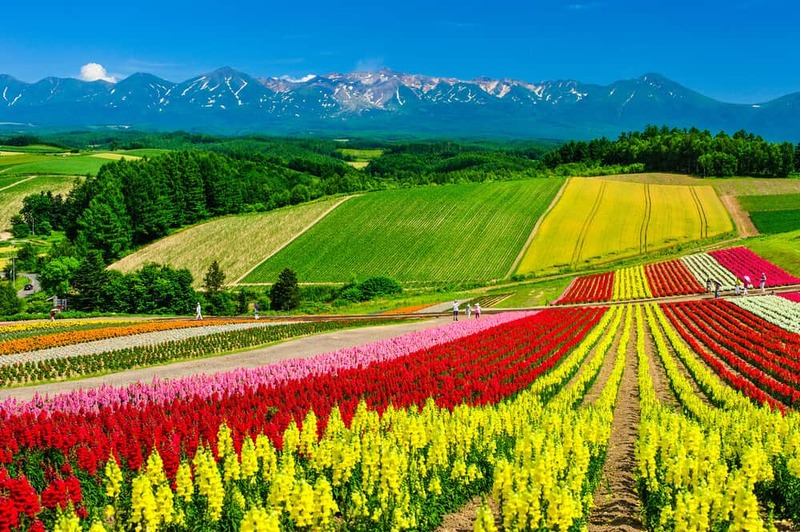 You can take in the flower fields and the surrounding Tokachi mountain range. 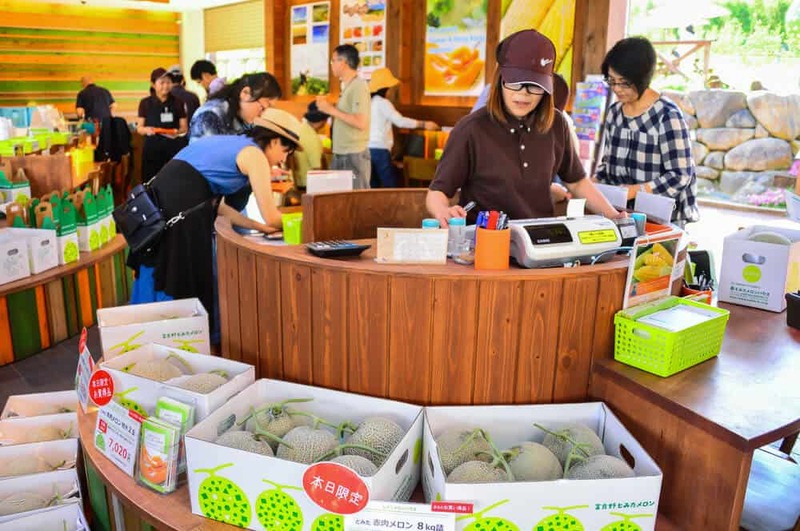 Shikisai No Oka (Located in Biei) is the largest and best-recommended flower farm in Biei. The season is longer on this farm. The 15 hectares of fields bloom from April to mid-October. The flowers include tulips, dahlias, and sunflowers, in addition to lavender and salvia. There are a variety of ways to get around the farm. You can rent a cycle or golf buggy, or take a ride on the farm’s tractor bus. In winter, you can rent snowmobiles and rafts to enjoy the snow-covered hills. Technically free, but a 200 yen donation is requested to cover maintenance costs. There are many other flower farms near Biei and Furano. Finding a way to get to them can be challenging. Here are some helpful options. The Biei View Buses runs from May 3rd- October 9th, with several routes focusing on Biei’s attractions. The Flower Garden/Blue Pond Bus gives you a tour of some of the flower farms. You also visit Biei’s blue pond, a man-made water feature created to protect Biei from volcanic mudflows. The water’s striking blue color was an unforeseen consequence. Bus tickets cost 2,500 yen for an adult and 1,000 yen for a child (aged 6 – 12). There are three departures daily, and the trip takes two hours and fifty-five minutes. You can buy tickets the day before you go from the Biei Tourist Information center, next to Biei Station. 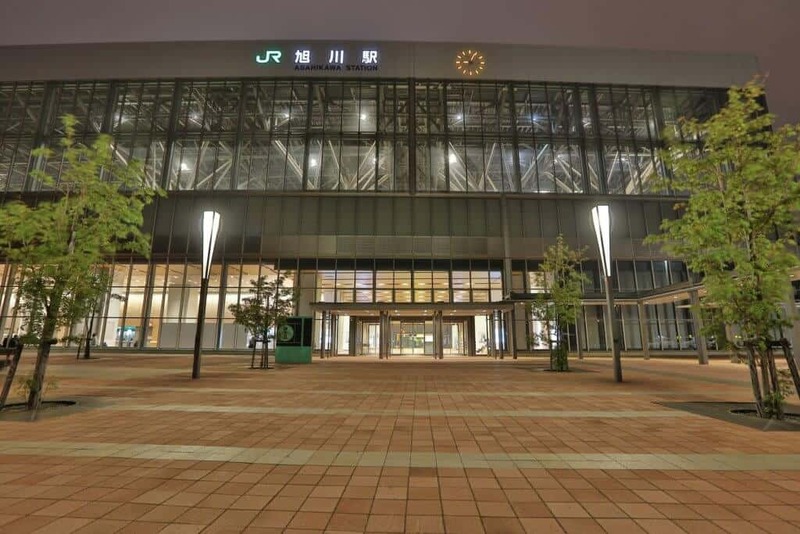 You can also buy tickets two days in advance from the JR Information Desk at JR Sapporo Station, or from the JR info desk at JR New Chitose Airport Station. Please note that you need to buy tickets ahead of time. The bus doesn’t allow anyone aboard withk tickets, even if there are seats available. 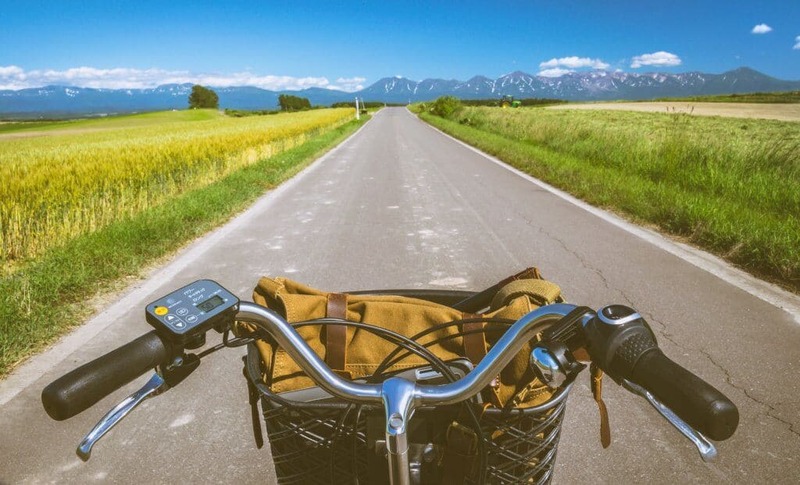 You can rent a cycle to explore the roads around Biei and Furano. They’re considered among Japan’s most beautiful roads. An 80km cycling road links the two towns. This is a great place to bike; the area has clear signs and lots of cycle rental shops. When you’ve had your fill of flowers, take in the scenery of a different kind at Daisetsuzan National Park. 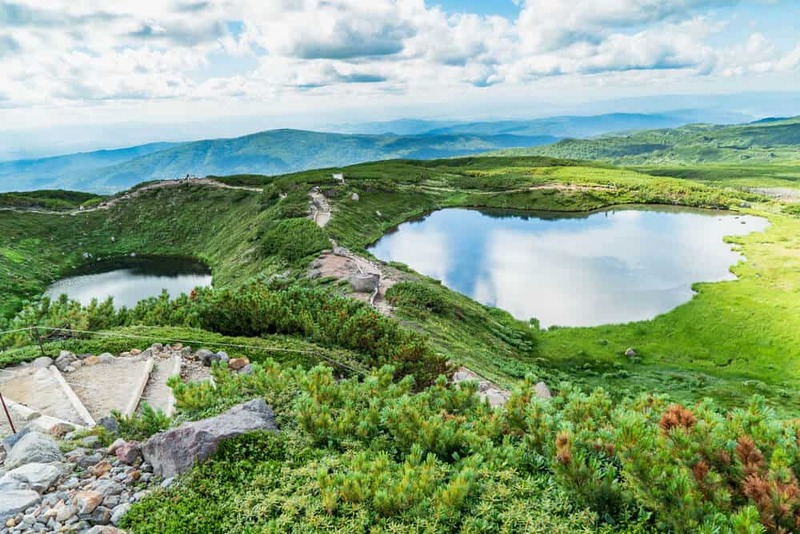 Daisetsuzan means “Great Snowy Mountains.” You can see snow even in the summer season (July – August), but most people will be amazed by the alpine flowers. Many of these are found only in Daisetsuzan National Park. Mt. 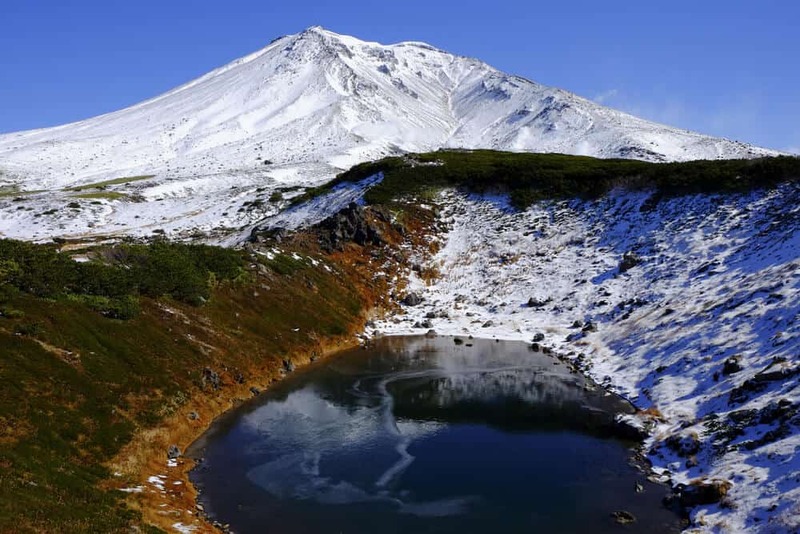 Asahidake is the tallest mountain in Hokkaido and the best place to see the flowers. 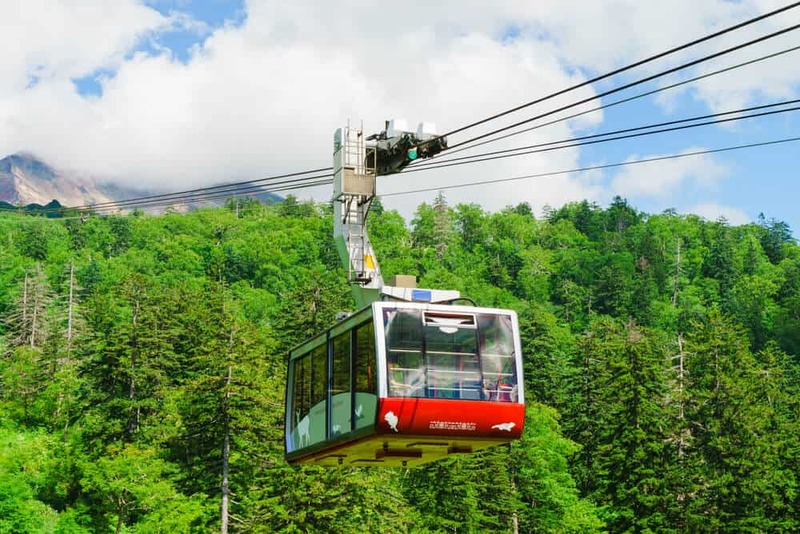 I suggest you take the Asahidake Ropeway halfway up the mountain to the Sugatami Plateau. Enjoy the trails and take in the flowers, ponds, and fumaroles. Fumaroles are openings where volcanic steam clouds come out. Asahidake is an active volcano. Serious hikers will love the Asahidake Trailhead. It’s the start of a 55km hike linking Asahidake with Tokachidake. The hike takes 5-7 days, with hikers able to break their hike at huts along the trail. There are a variety of less intense hikes as well. If you go hiking, take the usual precautions. File a travel plan with the park authorities, boil water before you drink it, and carry a bear bell. Dispose of your trash carefully — especially food wrappings. Secure your food to make sure you don’t attract bears. Asahidake Onsen is a tiny village with a handful of hotels and a youth hostel — and, of course, the onsen. There are six hotels that open their baths to visitors. You’re probably wondering “Who wants to sit in a hot bath in summer?” Let me tell you… after a long, hard hike, it feels fantastic to relax and wash your weariness away. You won’t want to linger in the bath, but once you get out, you’ll feel much cooler by comparison. Try it! If you’re already a summer onsen convert, consider making the trip to Kurodake Sounkyo Onsen. There’s a greater variety of baths there. Buses run from Asahikawa Station to Asahidake-Onsen. The trip takes a little over two hours and costs 1,430 yen. To get the most out of your trip to Asahidake, aim for the 10:10am bus. The Ropeway is within the Asahidake Village. *Regular season is October 21st – May 31st, and the peak season is June 1st – October 20th. The Ramen Village sits on the outskirts of Asahikawa. Although it’s not a village, there is ramen — lots of it! Asahikawa is famous for miso-broth based ramen. The thin noodles are tougher than the typical ramen noodle. 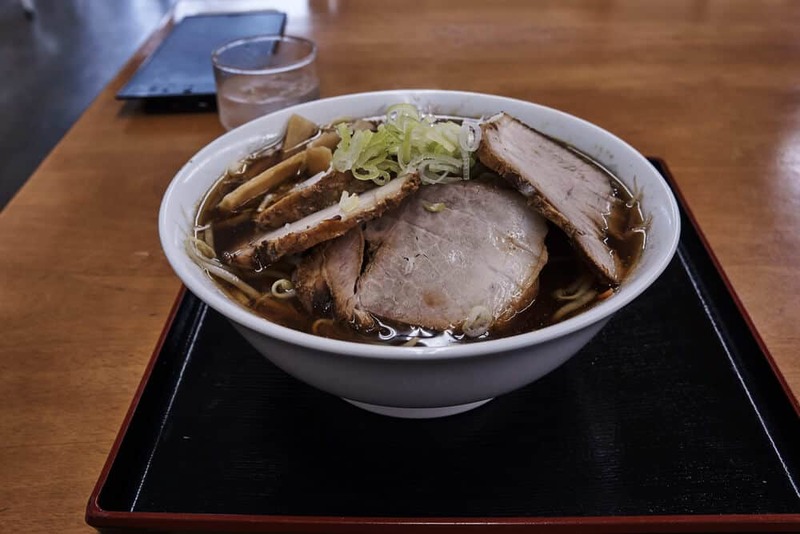 You can find ramen shops throughout Asahikawa. The Ramen Village showcases the city’s eight most popular ramen stores. There’s a gift shop and ramen shrine attached. Free — but you’ll probably want to buy some ramen, about 800 yen a bowl. Can you afford the visit, and do you have the time? You’ll spend a lot of time and money to get to Asahikawa. I recommend Asahikawa as part of a longer trip to Hokkaido. Devote 2 – 3 days to the Asahikawa area. Rent a car if you can. It makes things much easier! If you don’t rent a car: look up train and bus times in advance to make sure that you don’t wind up spending hours waiting. There are several ways to travel to Asahikawa. Asahikawa Airport has domestic flights to Tokyo’s Haneda Airport, Osaka’s Itami Airport, and Nagoya Airport. 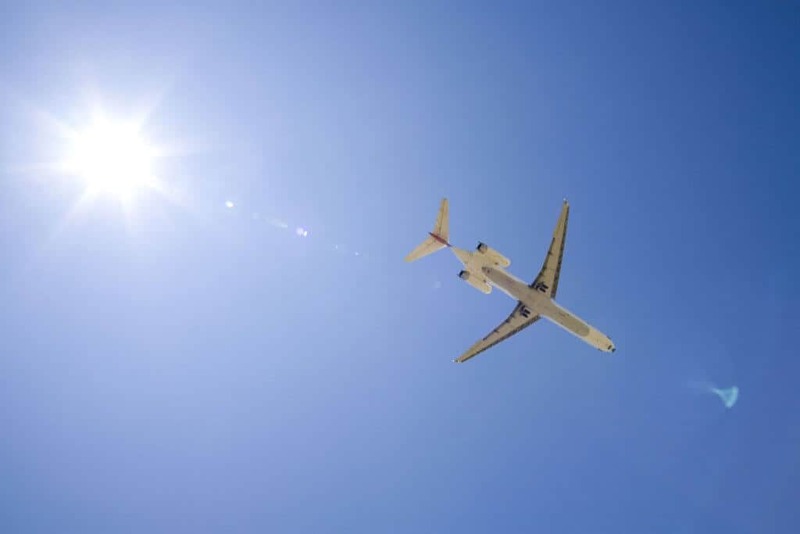 International flights go to Incheon, Shanghai, and Taipei. The domestic airlines serving Asahikawa Airport include Japan Airlines, Air Do, and ANA (All Nippon Airways). Prices depend on seasonal demand, time of day, and type of seat. As a baseline, a round trip between Haneda and Asahikawa on a Japan Airlines economy flight can cost anywhere from 18,280 yen to 83,780 yen. You really save when you plan ahead! The flight takes about an hour and forty minutes. Asahikawa Airport is a 30 to 40-minute bus ride from Asahikawa Station (620 yen). It’s a 30-minute taxi ride (around 4,100 yen). Travelers with International Drivers Licenses can rent cars at the airport. Asahikawa Station links to Sapporo, Otaru, and Hakodate on the JR Hakodate Main Line. The Super Limited Express from Sapporo reaches Asahikawa in just 85 minutes. It costs 4,810 yen. Local trains are sparse, and while cheaper (around half the price), take between 3 to 5 hours to make the same journey. The trip takes around 10 hours and costs around 30,000 yen. From Tokyo Station, take the Hayabusa Shinkansen to Shin-Hakodate-Hokuto. Transfer to the Limited Express Hokuto for Sapporo. At Sapporo, transfer to the Super Limited Express for Asahikawa. The Asahikawa Express Bus Line runs from Sapporo Station to Asahikawa. Buses run every 30 minutes. The trip takes 2 hours and is 2,060 yen one-way, 3,860 yen round-trip. 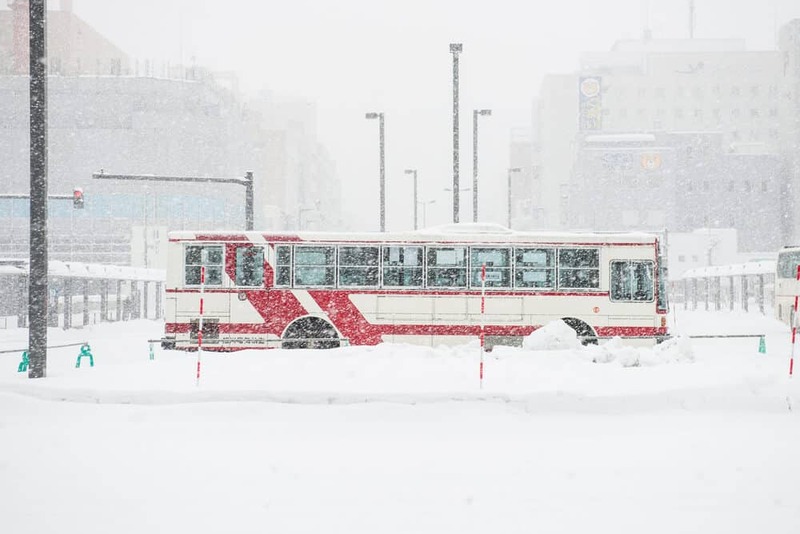 The cost of transportation will be one of your biggest expenses in Hokkaido. This is just as true once you’ve reached Asahikawa. If you’re traveling in a group, consider renting a car. 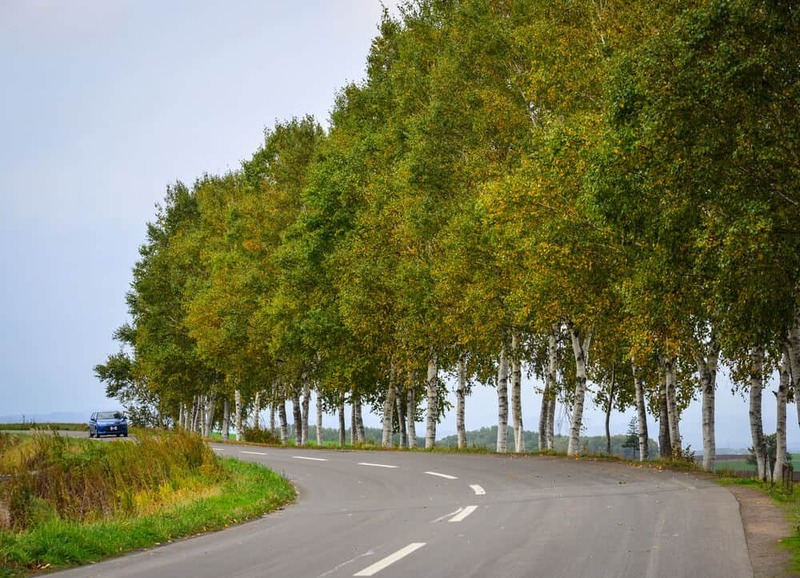 The roads around Biei and Furano are some of Japan’s most scenic. Driving is usually faster than relying on the sporadic trains, despite the 60km (37mph) per hour speed limits. If you travel by train or other public transportation, check the schedule in advance. Due to the lower population compared to the rest of Japan, Hokkaido’s trains are less frequent. This leads to long waits if you’re unlucky enough to miss your train. Pack for a wide variety of weather situations — especially if you plan on hiking! Every year, many hikers underestimate the weather in Daisetsuzan National Park. They find themselves in trouble. Have You Been to Asahikawa in Summer? Did you see the flowers or the Great Snowy Mountains? Would you like to? Did anything in this article make your must-visit list? Let us know in the comments. As I mentioned before, the flower fields get 10 times the visitors the ski slopes get. There’s a good reason why. Share this article with your flower or nature loving friends. Get a group together, and then come and discover the area for yourself. You can thank me later!